Johnson County, KS — A family grieving and a town left in shock after police responded to a welfare check of a beloved high school student Saturday afternoon—and killed him. 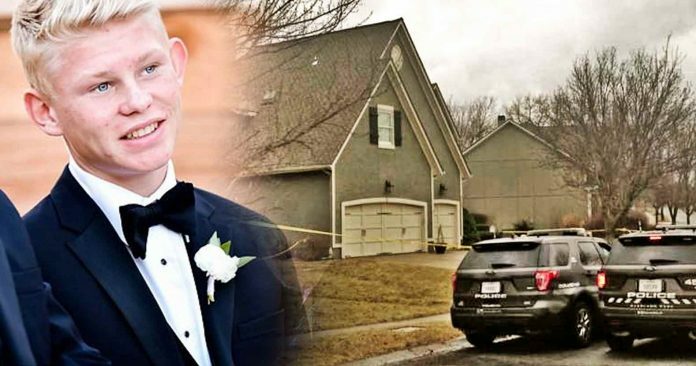 Blue Valley Northwest High School junior John Albers was unarmed and backing out of his garage when an Overland Park Police Officer opened fire on him, killing him on the spot. The incident happened on Saturday but the dispatch recordings were released Monday night which paint a picture of what happened. The most crucial part of the picture, however, is missing, and that is why the officer felt the need to kill the 17-year-old wrestling and track star. The officer was entirely unharmed in spite of creating a dangerous situation in which the teen lost control of the vehicle as he was filled with bullet holes—illustrating the entirely unnecessary escalation of force. The officer who fired his weapon and killed the high school junior has yet to be named. The department only said that he has been placed on administrative leave while the shooting is being investigated by the Johnson County Officer-Involved Shooting Team. Albers’ death has hit the community hard, especially his schoolmates who remembered him as “loving,” “loyal,” and “giving.” On Sunday, dozens of students gathered to hold a vigil for the slain teen. Albers was “very caring, very outgoing, very loyal,” and “very, very, very giving,” junior Gabriel Bright told BNVW News. Indeed, while many people think police killings are reserved for a certain section of society, as Albers’ case illustrates, it can happen anywhere.